Recently, Jenna Bush, daughter of former President Bush, conducted an interview with Josh Gad on the NBC news magazine Rock Center. Josh Gad plays the fictional son of the President on NBC's comedy 1600 Penn. Was this interview newsworthy (life in the White House), promotional (a real child of a President interviews the fake child of a President) or both? All of the above, probably. 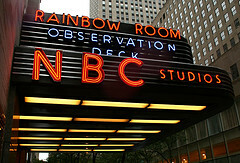 It's part of NBC's overall effort of cross-promotion referred to as Project Symphony. This same type of cross-promotion is possible in any business applying inbound marketing principles and can support increased traffic and leads. Cross promotion offers an opportunity to share something valuable while targeting leads you might not have reached otherwise. Trade shows - sure you can have a booth filled with swag, but don’t hesitate to have a copy of your latest white paper on the USB drives that you give away. Ultimately, NBC, whether producing a news program or comedy show, is a content creating machine. Think of your marketing organization as a content creating machine that produces blogs, whitepapers, videos and a variety of other content that can be cross promoted.